This is fish time again! Hope anybody will not complain! Since fish is most popular in any Bengali home, you will often see one or another form of fish dishes in my blog. Nowadays most of my friends are great cook and showing more interest in cooking. 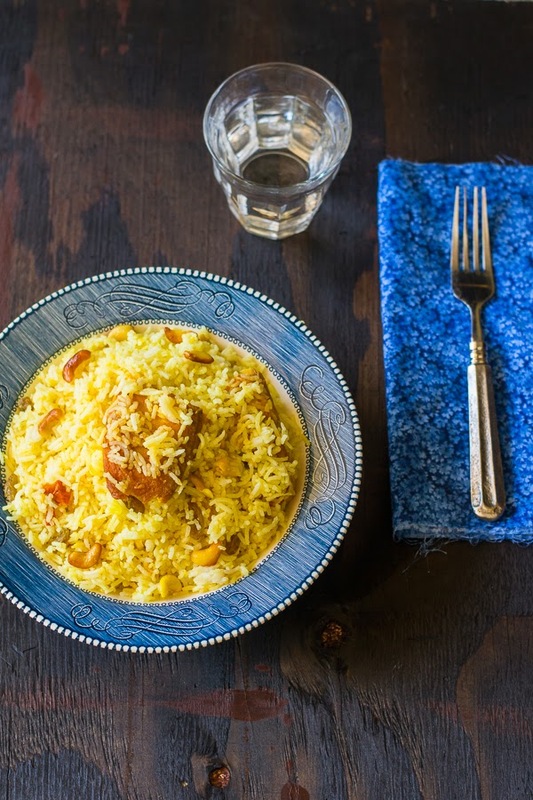 This recipe was inspired from the the lovely dish 'Fish Biryani' that one of my San Diego friends made, when we visited to her home last month. I really liked the taste and asked her for the recipe. 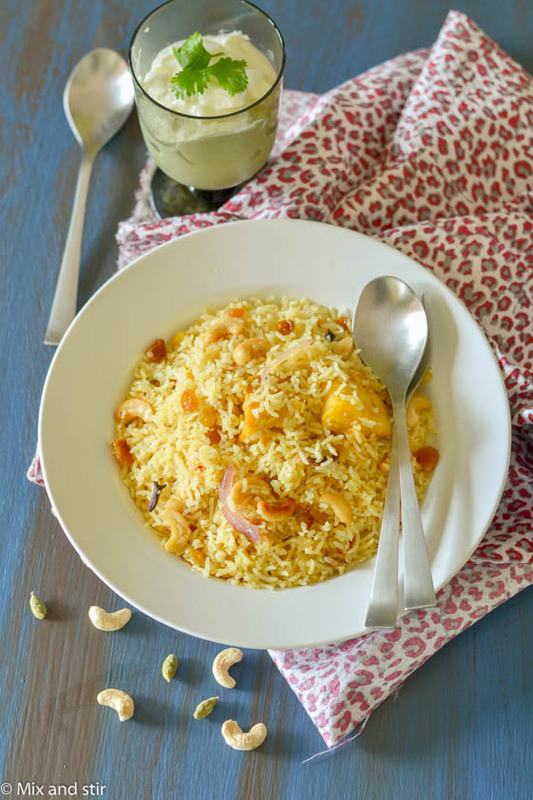 Today I will share the recipe of 'Fish Pulao' ( Indian Fish Pilaf ) which is mouth-watering as well as stomach filling. I already tried this dish three times at my kitchen and every time it was a big hit. It is the most comforting one-pot meal, not so spicy, still flavorful and delicate. If you don't have much time but want to prepare something tasty and quick, then it is the perfect choice. It will take less than thirty minutes and with a bowl of Raita ( yogurt based vegetable salad ), it's a complete meal. It's also a perfect for office or kid's lunch box. 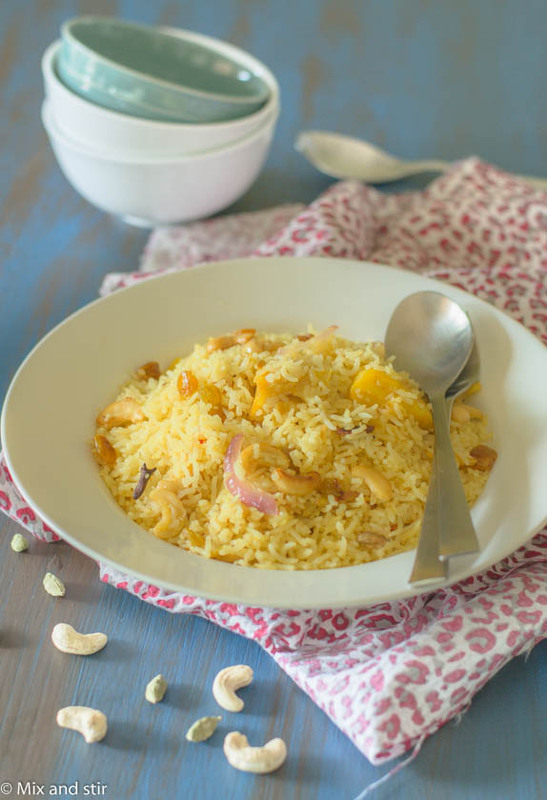 Pulao is rice based dish made of vegetables/ meat / fish. Long grain and flavored rice like Basmati are often used to make Pulaos. 1. Wash and then soak the rice for about 15 minutes. Take a dip-bottomed pan, add 5 to 6 cups of water and heat it up. Once water starts to boil, add the rice and cook until rice is almost done. (90 % done). Make sure that rice is not overcooked. 2. Drain out the excess water out and spread the rice on a flat surface. Let it cool down completely. 3. Wash the fish pieces, sprinkle salt and turmeric and mix it well. 4. Take a pan, add oil to it and heat it up. Once oil is ready, add chopped onions, saute it till it is light brown, add ginger and garlic. Stir it and let it cook until raw smell goes off. Add tomato, sprinkle salt and again give some stirs. 5. Once tomato becomes cooked and soft, add turmeric powder, coriander powder and red chili powder. Stir it and mix it well until oil comes up from the sides of pan. 6. Add fish pieces, gently mix it with the other spice mixture and give a nice coat of spice. Lower the flame, cover the pan with lid and cook for 7 to 10 minutes. 7. Open the lid, check the taste and add salt or chilies if needed. 9. Add the cashew, give some stirs and add the raisins to the pan. Within couple of minutes add rice, mix it well and add salt and sugar. Add the fish pieces and again gently mix it with the rice. 10. Add 1 tbsp of ghee, check seasoning and cover it with lid. Lower the flame and let it cook for about 5 to 7 minutes. 12. Fish Pulao or Pilaf is ready !! Serve hot with raita ( yogurt based salad )! 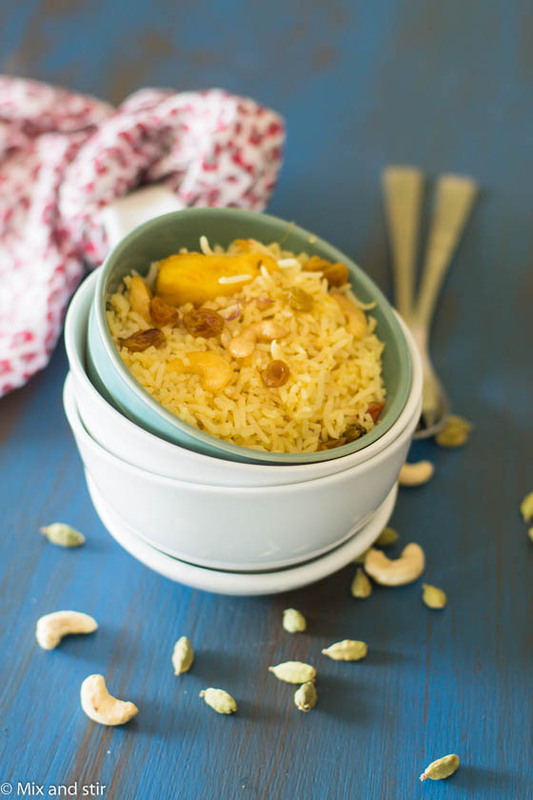 Note : You may try this recipe with Paneer ( home-made Cottage Cheese) to make this dish vegetarian. Don't need to cook the paneer separately like fish. ( skip Step 3 to 7 ) Fry the paneer pieces to golden brown before adding onion and set it aside then follow the rest except in Step 9, add paneer pieces in the place of fish. I've had vegetable and chicken pulao before but never fish - this looks so good! Thanks! If you like to eat fish, should try once! Thanks! I even tried it after eating same kind of dish Fish Biryani at my friend's place. This is third time I made Fish Pulao in this month, and must say this is too good! I love Pulao in any form. I've never tried Fish Biryani though, yours looks really delish. Nice to meet you and your blog. Thanks! glad to know that you liked it..!! This looks good! 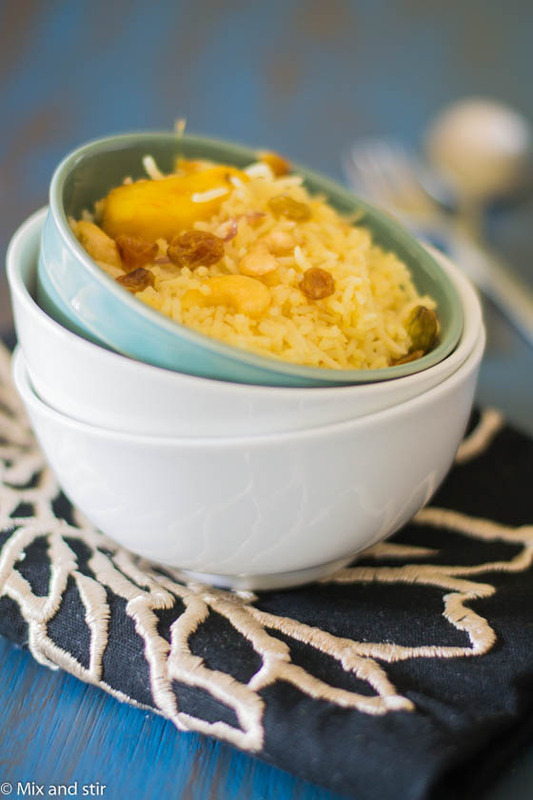 I think this recipe is perfect for my breakfast, because of the rice. I'm sure I can have my heavy breakfast with this. Thanks for this wonderful idea!